UMBC researchers at the Institute of Marine and Environmental Technology (IMET) in Baltimore’s Inner Harbor have developed new ways to raise commercially important fish in land-based, sustainable systems through decades of intensive research. Now the Aquaculture Research Center (ARC), where the team grows fish such as bluefin tuna and cobia, is in full operation, and the team is donating much of their harvest to Baltimore communities in need as part of a unique public-private partnership. 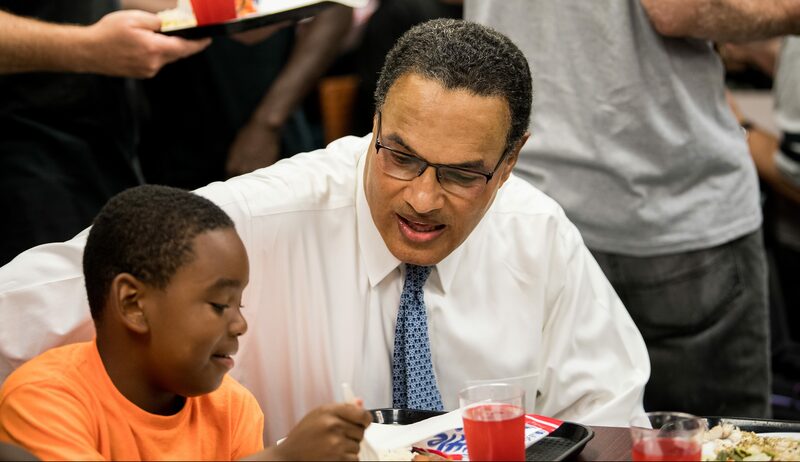 UMBC President Freeman Hrabowski talks math with a young guest at the Franciscan Center. 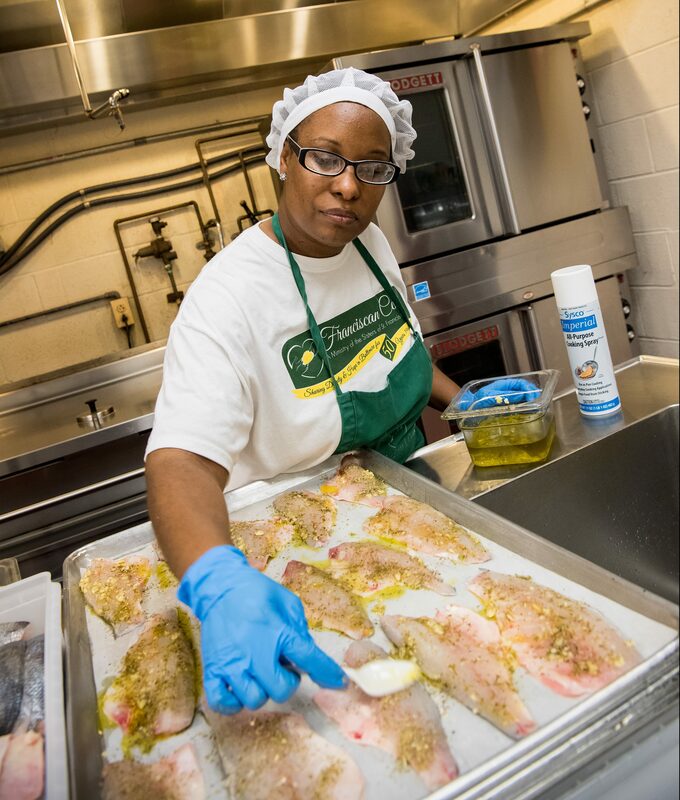 UMBC, the University of Maryland Center for Environmental Science (UMCES), United Way of Central Maryland, McCormick’s Flavor for Life® program, and seafood distributor JJ McDonnell joined forces to launch the FISH (Feeding Individuals to Support Health) Project. The goal is to improve the health of Marylanders in underserved communities by providing fresh fish—a healthy source of protein and other nutrients. The partners gathered at Baltimore’s Franciscan Center on June 25 to announce the initiative, and center guests enjoyed bronzini grown at the ARC. “UMBC is proud to be part of this important collaboration, applying scientific innovation in aquaculture to offer a healthy source of food for our local communities,” said UMBC President Freeman Hrabowski. A staff member prepares fish raised at IMET for a midday meal at the Franciscan Center. The ARC is a one-of-a-kind facility specifically constructed to avoid the pitfalls of other approaches to fish farming and catching wild fish. The environment is highly controlled and fully separate from waterways. This means there’s no risk of external pathogens sickening the fish. It also means there is no risk of fish escape — a concern with outdoor net pens — which can be an ecological nightmare if the fish are non-native species. This approach to growing fish is also highly efficient. The researchers can create the ideal conditions for fish growth by tuning the salinity, temperature, and other factors. The facility converts solid fish waste to methane, which is then used to partially power the equipment. And there’s no risk of overfishing, as some of the adults are retained as brood stock to produce the next generation. In addition, with the ability to control daylight hours, the team doesn’t have to wait for the natural spawning season and, once the system is perfected, can expect to harvest market-size fish several times per year. 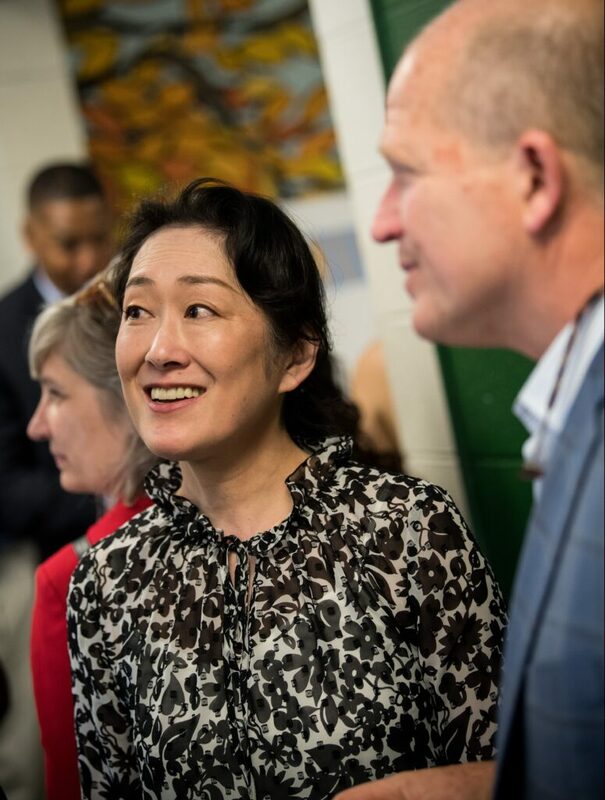 Keiko Saito, research assistant professor in marine biotechnology, discusses the project with other attendees at the launch event. UMBC and UMCES provide the scientific expertise, but the FISH project wouldn’t be possible without leveraging each partner’s strengths. JJ McDonnell will process the fish and distribute it to partner nonprofits that reach underserved communities directly, like the Franciscan Center and Maryland Food Bank. McCormick’s Flavor for Life® program will generate simple, healthy recipes that utilize low-cost ingredients, which community members will receive along with the fresh fish. The United Way of Central Maryland is the lead organizer of the project, bringing all the moving parts together. “In many of the communities we represent, individuals and families do not have access or the financial means to purchase healthy food, like fish,” said Franklyn Baker, president and CEO of United Way of Central Maryland. He reflects, “this project is a huge step in helping us win this fight,” to help local residents access resources that can help them lead healthy lives and pursue their goals. More information about the FISH project is available through IMET, as well as press coverage of the launch event in the Baltimore Sun, Baltimore Business Journal, Daily Record, WMAR-TV, and WBAL-TV. Banner image: A mother and son who have just enjoyed a meal at the Franciscan Center, which included fish raised at IMET. All photos courtesy of Howard Korn Photography.